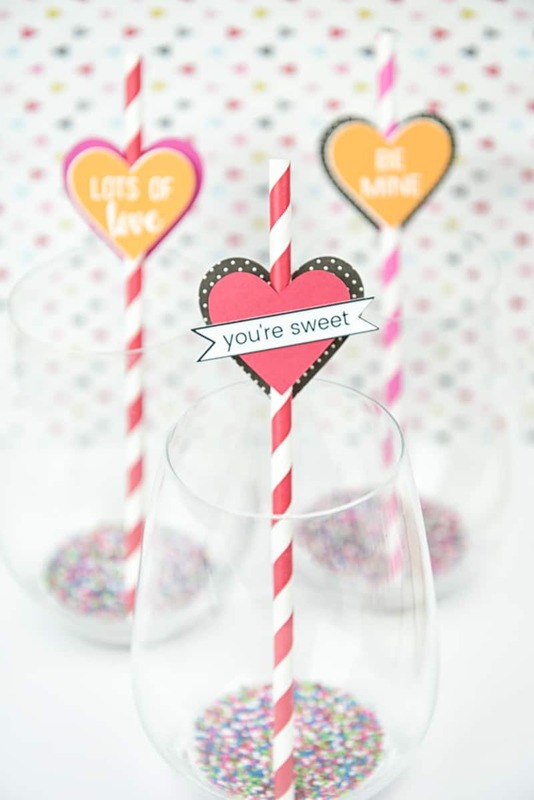 These Heart Straw Toppers add a touch of fun to any glass for Valentine’s Day! At the beginning of the year, once all the Christmas decorations are down and the house is clean, I realize how incredibly bare and empty my house looks. Part of me really likes it because there isn’t as much “stuff” hanging around. Plus, the lack of decor makes me feel more clean and organized. But I also really start to miss the warm and cozy feeling of having my Christmas decorations on display. And all the colors, Christmas brings lots of colors! So even though I’m not a huge fan of decorating for the upcoming holidays, I’m going to do it anyway. Because nothing says color like these fun heart straw toppers! This past weekend I went to clear out my craft area (because it’s a mess) and realized I have so many craft supplies I forgot about because they were buried under piles upon piles of stuff. One thing I’ve noticed that I collect more than any other craft item is cardstock (though vinyl is a very close second). For some reason I don’t use paper a lot, so what I do have just sits in a corner and collects dust. I knew that I needed to get rid of some of it, and with Valentine’s Day coming up it seemed like the perfect reason to use some of my more colorful supplies. The brighter the colors the better! And I was really excited that I had plenty of paper and even colorful straws to complete the project. 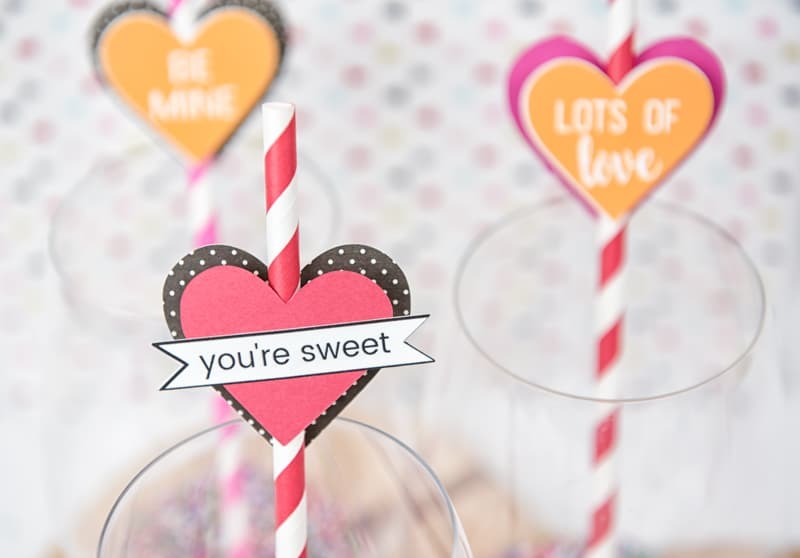 Honestly, these heart straw toppers would look so cute as part of a Valentine’s Day tablescape. Those aren’t really my forte, but I can just imagine how much color and sweetness they’d bring to a table. PRO TIP: For this project you can use the Silhouette Cameo or cut out the shapes yourself! You do not need a Silhouette to complete this project though it will be more time consuming to cut everything out yourself. Heart-Shaped punches (like this Martha Stewart punch) would make easy work of cutting out the hearts as well. + Download and print out the heart straw topper file. Make sure there are registration marks on your file before you print it out! + Load your file onto your Silhouette mat and cut out your shapes. + Now comes the fun part! 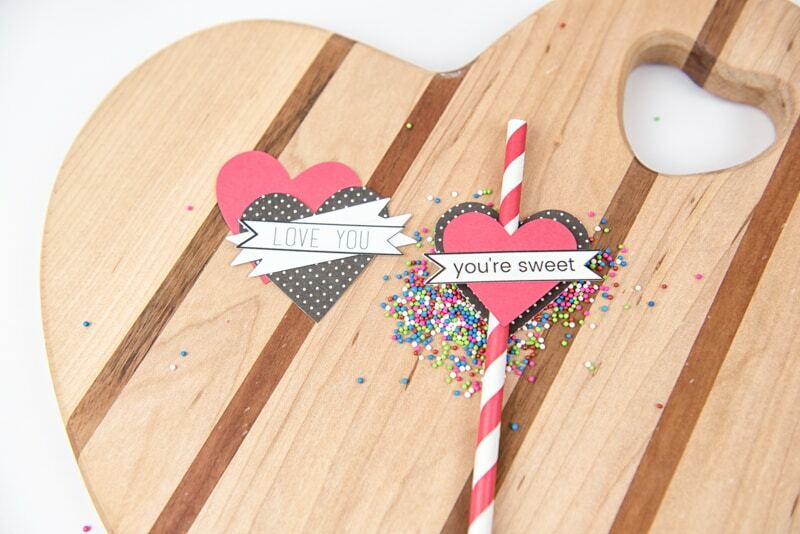 Using double-sided tape attach the hearts and saying to the straws. Mix colors and patterns, have fun with it! I tried to mimic what you’d see on candy hearts on these paper heart straw toppers. I love them! They’re so cute and add such a fun element to the glasses. I know you’d probably want to put a delicious cocktail in the glasses, but I opted for sprinkles instead. Because what is Valentine’s Day without a little bit of sugar? The best part about this craft? It’s so easy that no crazy craft skills are required. Just grab your favorite cardstock colors and patterns and get crafting! Do you decorate your house for Valentine’s Day? Check out these other Silhouette related posts! And check out these other posts from the Crafty Destash Challenge! Very cute idea. My kids would love these. These are so cute!!! I love how they can be customized and even act as place settings with guests names. So fun. What a fun idea! These would be a fun surprise for my kids – they would love the cute sayings. These are lovely to make for any party! Those are so so cute. I want to make them now!!! This is such a great project! I love pretty much anything Valentine’s Day!! Very cute! My kids would love these. Visiting from Crafty Destash. These are so cute. I can see them in a tablescape. I do like how colorful the straw toppers are because you are right, after Christmas we need a little color in our life. Very cute, I’m going to share this with my daughter, she always wants to get fancy straws for parties and holidays! These are super cute. I need to get my Cameo out and start using it more!! I love these–they are so much fun! I think these are super cute. I would have loved using them when I was a kid, and I think my grandchildren would like them, too. Those are adorable! We have tons of paper straws. I totally agree that they would be great as table toppers. But they would also be adorable added to pencils as Valentine’s Day classroom gifts. I don’t decorate for Valentine’s Day, but these are so fun! Love the colors. I love easy little party favors like this, they can really snazz up any holiday! Love the free printables! These are so pretty and add a nice touch. I will be borrowing this idea.